Give Today and Your Gift Will Be Tripled! Home > Uncategorized > Give Today and Your Gift Will Be Tripled! Parent Voices is celebrating our 20th Anniversary this year, what an exciting time! In 1996 no one thought parents would have the time or desire to advocate for their kids, but we have found that—given the opportunity—parents are ready and willing to stand up for their children! And Parent Voices has been providing that opportunity for parent leaders for the past two decades. To honor this big milestone, one of our funders has offered a $5,000 matching grant—if we raise $5,000 more, they will give us *another* $5,000 more for a total of $15,000! That means your gift will be tripled! Can you make a donation today to help us reach this goal? Parent Voices has accomplished so much in the past twenty years. We successfully led a campaign to restore the Stage 3 Child Care Program which was line-item vetoed by Governor Schwarzenegger in the fall of 2010. Since then, Stage 3 has been fully funded! $75 provides transportation for two parents to participate in the statewide parent leadership training: Knowledge is Power. $250 provides meals, lodging, and childcare for one parent to participate in the statewide Parent Leadership Retreat . $1,500 would pay for one bus to bring 55 parents up to Sacramento to participate in Stand for Children Day. Whatever amount you can contribute is greatly appreciated. With the support of community members like you, Parent Voices can make a real impact in the quality of child care for many more children in California. 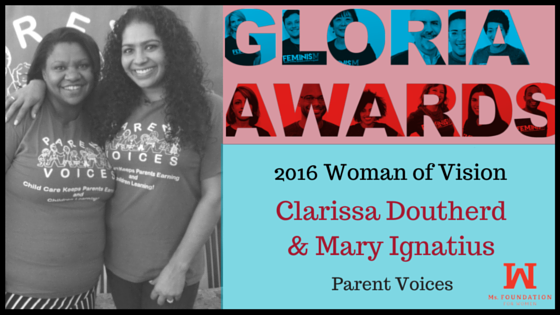 This year, the Ms. Foundation for Women is proud to honor Clarissa Doutherd and Mary Ignatius from Parent Voices as two of our Women of Vision at our annual Gloria Awards! Clarissa Doutherd as the Executive Director and Mary Ignatius as the Statewide Organizer for Parent Voices dedicate themselves to making sure child care is available, affordable and accessible to parents in the Bay Area. Both Clarissa and Mary have extensive backgrounds as grassroots activists working on social justice issues: and as parents, their firsthand experience dealing with the difficulties of childcare lends to their passion and commitment for making sure other parents can find the support they need. We congratulate both Clarissa and Mary as Women of Vision for their tireless efforts on behalf of women and their families in the Bay Area!